Looking for a great deal on camper, motorhome and RV rentals in Canada for 2020? With pickup locations in Vancouver, Calgary, Edmonton, Whitehorse, Toronto, Montreal and Halifax, CanaDream has exactly what you're looking for! In addition to our low early booking rates, you can save money by reserving your RV, camper or motorhome vacation before 31 October 2019. You'll be assured of your preferred vacation dates and our low early booking pricing. Standard terms and conditions apply. 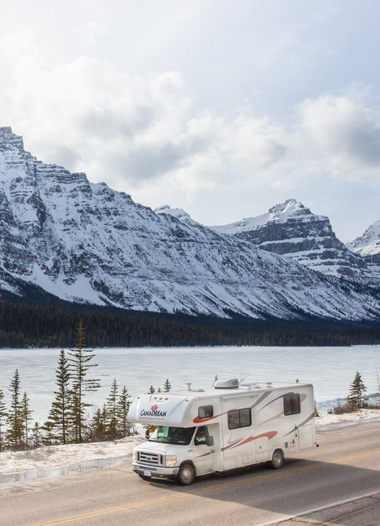 In addition, choose 1 from 4 available options and save up to $740.00 on your 2020 Canadian RV vacation when you book by 31 October 2020. Applies to pick ups from 6 April to 1 November 2020.
a total saving of up to $740.00. Savings will vary based on number of vacation nights booked. Purchase a minimum of two 500 km packages and save 50%. This special will save you a minimum of $170.00. The One Way Special allows you to pick up at one CanaDream location and drop off at a different CanaDream location for half the normal one way fee. This offer is valid only on bookings of 14 nights or more. Please note no one-way bookings are permitted into or out of our Edmonton location. This special will save you up to $700.00. The Unlimited Kilometre Special will allow you to travel as far as you want at a 50% discount ($812.50) off our regular price. The Unlimited Kilometre package regular price is $1625.00 for a maximum of 21 nights. Price for additional nights is $75.00 per night.